Provide comfort for the family of Sherlin Vaughan with a meaningful gesture of sympathy. Mr. Sherlin B. Vaughan, 86, of Cartersville went home to be with his Lord and Savior January 1, 2019. Born on September 4, 1932, Sherlin was the son of the late Cicero Vaughan and the late Ethel Brooks Vaughan. He was the youngest of six brothers and one sister. His brothers were Felton, Frank, Herman, Dorsey and Ralph along with a sister Lillie Vaughan. Sherlin graduated from Cass High School and served in the US Army during the Korean Conflict. He retired from Lockheed Martin after thirty-one years where he was a department manager. Sherlin and wife Marie enjoyed traveling, camping, and staying at their cabin in Ellijay. They were active square dancers for many years. He was an avid golfer. Sherlin worked many hours getting the historic Vaughan home, cabin moved from Peeples Valley to Red Top Mountain State Park. 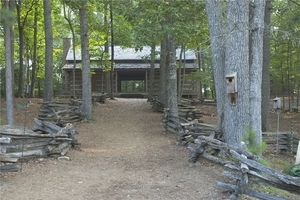 The cabin dates back to 1860; it was disassembled log by log and moved to Red Top Mountain State Park in 1996. It now serves as a focal point for a number of park events such as the summer music in the park series and Christmas at the Cabin. He is survived by his wife of sixty years, Marie Garrett Vaughan; his niece, Joyce Swinford and husband Wayne; Allan Garland; great niece, Jennifer Vann; and great nephews, Preston Garland, and Tim Vaughan; and several great-great nieces and nephews. Pallbearers will be Wayne Swinford, Allan Garland, Jeffery Vann, Terry Faust, and Bill Prather. He was a member of Cartersville First Baptist Church and Fellowship Sunday School Class. Visitation will be held on Friday, January 4, 2019 from 12:00 p.m. – 1:30 p.m. The funeral will follow at 2:00 p.m. at Cartersville First Baptist Church. Interment will follow on Tuesday, January 8, 2019 at Georgia National Cemetery in Canton, GA. In lieu of flowers the family kindly asks that all those desiring may make memorial donations in Sherlin’s honor to Cartersville First Baptist Church, 241 Douthit Ferry Rd., Cartersville, GA 30120. Parnick Jennings Funeral Home and Cremation Services is honored to serve the family of Mr. Sherlin B. Vaughan; please visit www.parnickjenningsfuneral.com to share memories or to leave a condolence message. To send flowers in memory of Sherlin Brooks Vaughan, please visit our Heartfelt Sympathies Store. We encourage you to share your most beloved memories of Sherlin here, so that the family and other loved ones can always see it. You can upload cherished photographs, or share your favorite stories, and can even comment on those shared by others. Provide comfort for the family of Sherlin Brooks Vaughan by sending flowers.